Naoshima Island is an 'art island' There are two big museums/galleries full of very expensive art and several arthouses where installations are permanently set up. 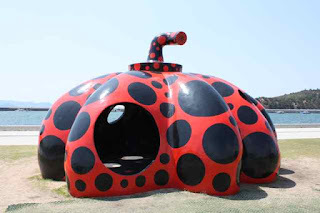 We couldn't take photos inside the art houses or museums but there are also some sculptures outside. 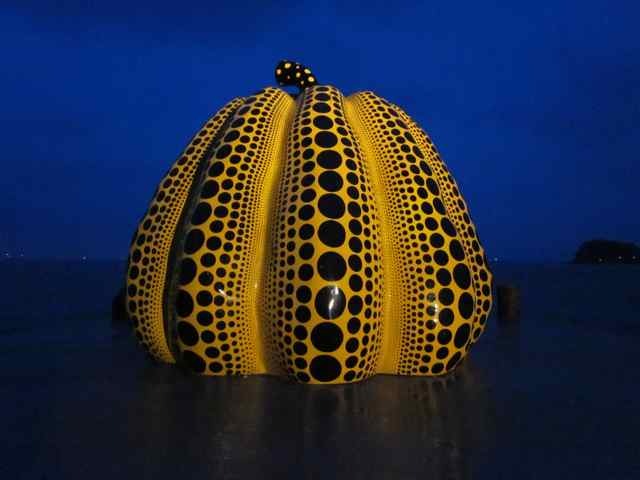 Probably the best known are the Yayoi Kusama pumpkins. Naoshima Island arthouse. 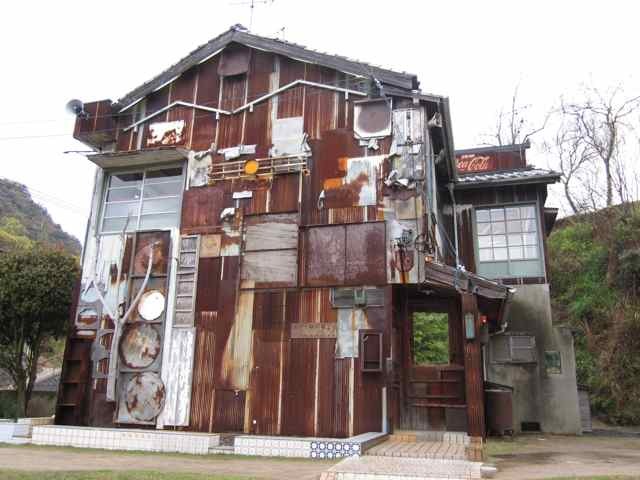 The house appears to be made of recycled materials so it is a surprise to go inside and find a 2 storey high statue of the Statue of Liberty. This picture of two boats doesn't look like much but inside the Bennese House art gallery there is a picture of a black boat and a yellow dingy. 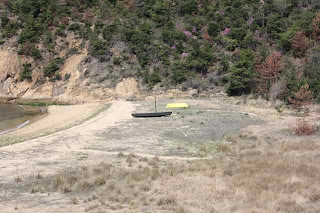 Underneath the picture is a real black boat and a yellow dingy and if you look out of the window you can see in the distance in a little bay, a black boat and a yellow dingy. 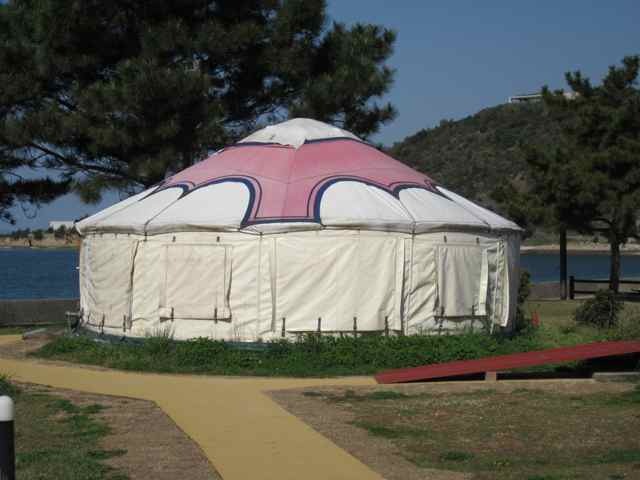 There isn't much low priced/hostel accomodation on the island. 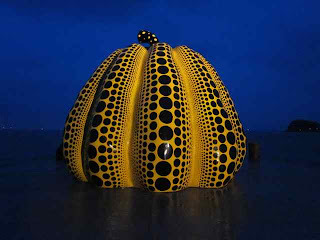 We stayed in a yurt near the yellow Yayoi Kusama pumpkin. 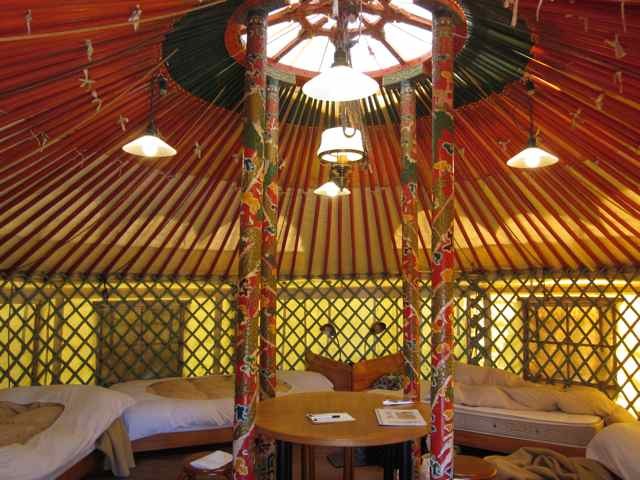 Most of the other yurts were empty so although we had pre-booked (booked by a Japanese friend for us) we could have just made a booking through the tourist information office at Uno station. The weather on the day we arrived there was very wet and it was hard to remove shoes outside the door of the yurt (which has no porch) whilst juggling bags and an umbrella. Then we had to take the shoes inside the yurt to stop the 'racoon dogs' eating them or stealing them. 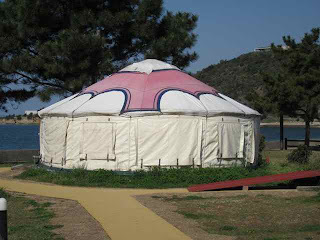 Yurt inside and outside. They are surprisingly comfortable inside with a great heater.